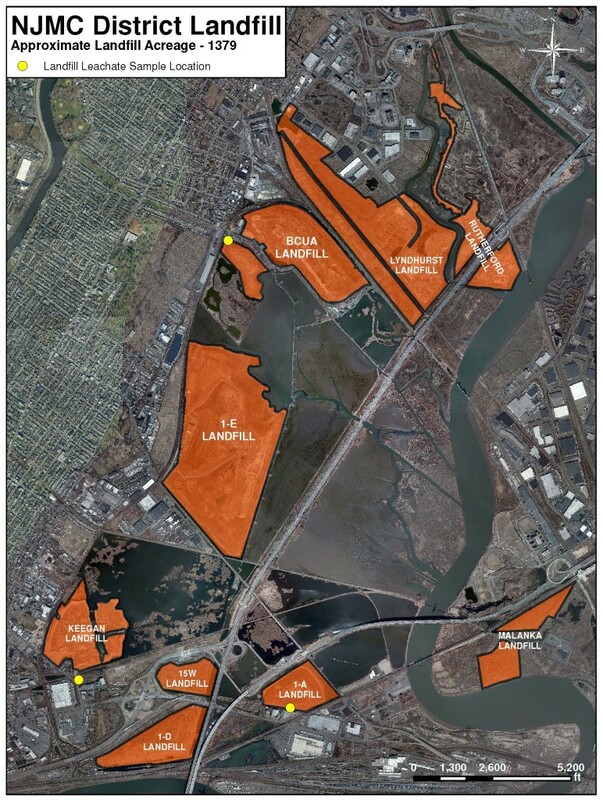 The Meadowlands has a legacy of the contamination from the approximate 1,400 acres of landfills in the District. The monitoring of the leachate from these landfills is extremely important to determine their impact to our local waterways and the estuary. MERI lab collects composite leachate samples monthly from 3 landfill site pumping stations including Keegan, Erie and 1A/1E, since 2012. MERI lab then analyzes these leachate samples for the selected parameters – Five-day Biochemical Oxygen Demand, Total Suspended Solids, Cadmium, Copper, Lead, Mercury, Nickel and Zinc which MERI has the NJDEP certificate (No. 02437). In addition, NJMC has contract with Advanced Analytical Technology, Inc. (AAT) for the additional leachate sample analysis including semi volatile and volatile organic compounds. The analysis results are sent to the Senior Engineer for the landfill permit compliance purposes. The leachate monitoring locations are depicted in Figure 1, please see below.